While Walkers minimalist designs generally abuse great design conventions with their bland and characterless styling, the Sensations range takes the same principles but gets it completely right. The bags are all black, which instantly makes them stand out on shelves, and even manages to add that upper class effect that they are going for. There is a broad flavour reference design in the centre and even the odd squiggly lines dotted about add to the exotic look and feel. For once Walkers have even taken the less is more approach with their small logo, which pops brightly from each bag. These Crisps crunched like slightly more thickly cut regular Crisps. There was a meaty firmness to them, and the crunch was sustained for longer than the brittle crisp snap of traditional Crisps. The crumbly munched bits and pieces also managed to maintain some of their credibility until the last knockings. For a premium range of Crisps, these lacked a certain amount of character. Certainly when compared to premium hand-cooked Crisps, anyway. However, there were rumbling and grumbling oil bumps, even if they were not major boils. There was also a slightly orange seasoning colour to them, which is similar to the colour of Cheddar in the USA. There were also a few little black dots about, which could have been the spicy addition, if there was one. A Nose Plunge Test revealed a slightly sweet Cheese aroma, but hopes were not high for a similar Taste Test result. 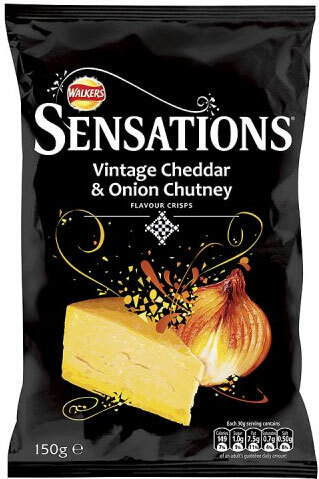 After all, these are called 'A Variation On The Popular Cheese & Onion Theme', or something like that. Well, wasn't our cynicism squashed, crushed and thrown in our faces. While Walkers are the world's biggest sellers (via this and their parent brand Lays), because of their inherent blandness, which never offends, and almost always rewards, these Crisps were simply stunning. First off there was an immediate hit of Cheese, and not the bland Cheese that is so familiar with this make, but a sharp and welcoming Cheese. And then, here comes the Onion. Almost as if following the Cheese through the door. Hang on a minute, what's that? Is it ginger? Is it mixed spice? Well, whatever it was, it blended the ingredients together to form, not just what it says on the packet, but also a quite magnificent Crisp.